Florida Uncontested Divorce: Download all your Florida uncontested (simplified) divorce forms with instructions, laws, and procedures for a do it yourself divorce in Florida. The state of Florida provides a way for married couples without children to an uncontested divorce procedure called Simplified Divorce. Do You Qualify for a Simple (Uncontested) Divorce? You and your spouse have no minor or dependent children together and the wife is not now pregnant. you are both satisfied with this division. Each of you must sign the Florida uncontested divorce petition in the presence of a deputy clerk (in the clerk’s office), although you do not have to go into the clerk’s office at the same time. You will need to provide picture identification (valid driver’s license or official identification card) for the clerk to witness your signatures. After you've filled out the Florida uncontested divorce form, you should file the original with the Clerk of the Circuit Court in the county where you live and keep a copy for your records. In addition to the Florida uncontested divorce petition, you must file the forms listed below. Form 12.902(c)- Each of you must complete a separate financial affidavit. Notice of Social Security Number - Each of you must complete a separate notice. Marital Settlement Agreement - You will complete one agreement together. Affidavit of Corroborating Witness This form must be signed by a person who knows that either you or your spouse has lived in Florida for more than 6 months before the date that you filed the petition for dissolution of marriage. This affidavit may be signed in the presence of the clerk of the court or in the presence of a notary public, who must affix his or her seal at the proper place on the affidavit. the testimony of another person who knows that either you or your spouse has resided in Florida for more than 6 months and is available to testify in court, or an affidavit, called the Affidavit of Corroborating Witness. If you and your spouse cannot afford to pay the filing fees, you may fill out an Application for Determination of Civil Indigent Status, and file it with your petition for dissolution of marriage. You may obtain this form from the clerk and he or she will determine whether you are eligible to have filing fees waived. Filing Fee - You must pay the appropriate filing fees to the clerk of the circuit court for the Florida uncontested divorce. Civil Cover Sheet - Either you or the clerk of court will need to complete a Civil Cover Sheet Form 12.928. Final Hearing - You must obtain a date and time for a court appearance from the clerk of court. This is called the Final Hearing. At the Final Hearing for the Florida uncontested divorce, you and your spouse must appear together before a judge. You should complete a Final Judgment of Simplified Dissolution of Marriage and bring it with you to the hearing. At the Final Hearing, the judge may grant a final judgment dissolving your marriage by signing the final judgment form you provided. If you fail to complete this simplified divorce procedure, the court may dismiss the case to clear its records. For more information about the Florida uncontested divorce, see chapter 61, Florida Statutes, and Rule 12.105, Florida Family Law Rules of Procedure. 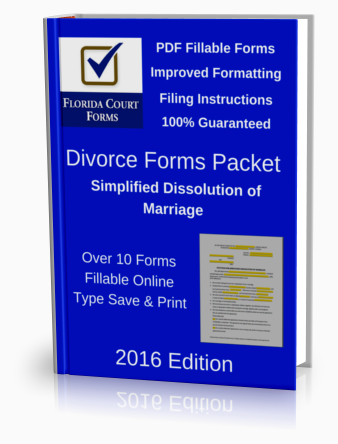 For your convenience, the following is a download list of the divorce forms most commonly used for a Florida Simplified Divorce.